How do you feel about transcribing files? Do you cringe when listening to your own voice in a recorded interview? Ask any media professional, and they are likely to agree that converting audio to text is a tedious and often dreaded process. Journalists, podcasters and scholars alike understand the necessary chore of producing quality transcripts. One hour — that’s about how long it takes the average person to transcribe 15 minutes of speech. Five minutes — that’s how long it takes Temi.com, a new automated speech-to-text transcription service. Temi is the fastest and easiest way to convert audio to text through the use of sophisticated speech recognition algorithms. Upload a file and get an easy-to-edit transcript delivered to your inbox in minutes for only 10 cents per minute. Temi is not a replacement for human transcription. When it comes to transcribing audio, humans are still far more accurate than machines. A human transcription service like Rev.com, for example, can deliver 99% accuracy or better. Accuracy for machine transcription, on the other hand, varies greatly depending on the quality of your audio file. With Temi, you can expect around 85-90% accuracy with clear audio. At a tenth or less of the cost of human transcription and with much faster turnaround time, Temi is a great solution if you’re looking to save money and don’t mind doing a bit of editing yourself. 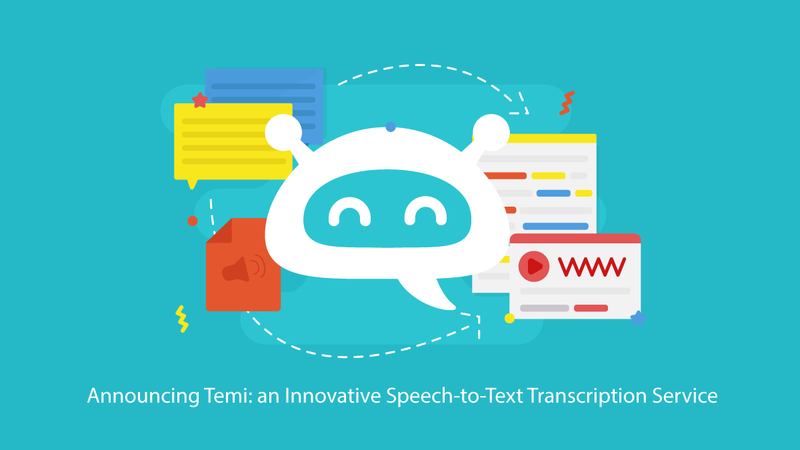 Temi is fantastic if you’re on a tight deadline and need to get your audio transcribed quickly. After running an audio file through Temi, users have a rough transcript of said audio. It won’t be perfect, but it will be easily searchable (if you’re trying to locate a specific quote), simple to clean up (using Temi’s editing tool), and much better than starting from scratch. With the Temi editor, you can see and change speaker names, follow timestamps, and click to jump to any part of the audio while following along with your freshly transcribed text. You can also edit the text and download it as a Word doc, txt file or pdf. Quality audio files yield quality transcripts. Temi is a machine and has trouble sorting through low-quality audio files or deciphering heavy accents. Not sure what determines the quality of an audio file? Check out these sample recordings to see what we mean. Here’s an example of a high-quality audio file. It’s perfect for automated transcription. Here’s an example of a low-quality audio file. A file like this is best suited for human transcription. As a brand new service, we’re working around the clock to make Temi meet the needs of those who can benefit from this fast, affordable alternative to traditional transcription. We’re currently working on making our service more accurate and faster. Please don’t hesitate to share any and all feedback with our team at temisupport@temi.com.